Acronym for technischer Überwachungs-Verein (Technical Inspection Association), TÜV represents some German certification companies, active in the field of food and environmental safety systems and supervision of the quality of the company management system. 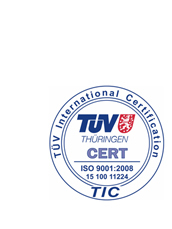 Attention to detail and attention to production processes have earned Tavelli F.lli Snc ISO 9001:2008 (or TÜV CERT) certification, synonymous with absolute quality assurance. In order to ensure the best possible design and product, the company is committed daily to maintaining high process standards that have brought a certificate of such prestige.